Apple platforms make heavy use of "reverse-DNS" identifiers. They appear everywhere from our Application's Identifier all the way down to the Dispatch Queues we create in our code. These identifiers are somewhat opaque in a conceptual sense, and have been around in programming for many years. We create or set them once, and sometimes reference them in our code, but the main idea is that they're a unique, human-readable way to identify some unique "thing". Their nature also offers the benefit of being unlikely to "collide" with one another. The first thing we'll want to define is some kind of top level prefix to put on all our identifiers. Fun Fact: Historically these identifiers were literally reversed-DNS. That is to say, to form one in code we might take our website's domain name, reverse it, then append our app's name (for example). These days, on Apple platforms, this isn't really a "thing" anymore. Now, we're usually given a string property or text field where we can supply just about any value we want. This means that the common TLD's on the internet are also commonly used here. A company may begin all of their identifiers with com., while a non-profit may start theirs with org..
Next, we'll want to think of some way to group all of our identifiers, across all of our apps. Often this is a domain-style version of our company or organization's name, or perhaps simply our own name, all lowercased, with no punctuation. This gives us something like com.littlebites. Great. Now we can apply this wherever we need to identify things. com.littlebites.reader - An identifier for an imaginary app to read Bites. We might be tempted to just use com.littlebites.app or something generic, but this way we leave ourselves open to the possibility of making other apps in the future. With these, we want to think about the complete set of In-App Purchases we plan on offering and create groups within them if possible. com.littlebites.reader.subscriptions.monthly, com.littlebites.reader.subscriptions.yearly - Here we have an imaginary subscription plan In-App Purchase. We know we want to offer other types of In-App Purchases in the future, so we've "grouped" all subscription purchases under a subscriptions. segment. Then we're able to add a shorter phrase denoting the type as the final segment. App Groups help us share data between our apps or our app's extensions. group.com.littlebites.cache, group.com.littlebites.user - Apple encourages to begin these with the group.. This way we know right away what we're dealing with. Here we've created two app groups, one to share less-important cache data (images, etc.) between apps while we sort of "wall-off" user data into it's own group. That's all for now, have a tip or some advice about these identifiers that to share? Send it to hello@littlebitesofcocoa.com. Swift Protocols are awesome. Understanding how they can (or should) fit into our code can be tricky. Today we'll take a baby step into the world of protocols with a simple, but "real" example and try to illustrate the upsides. Let's get started. See? Fancy. This is great if we want to specify each individual combination each time, but it'd be nice if we could define some sort of "pre-canned" layouts that we could use by name. Sounds like a great job for a Swift Enum. Lovely, this will be handy. How are we going to wire all this together though? Simple, we'll make a Protocol that's only responsibility is to convert itself to a LayoutSettings. Making our CannedLayout Enum adopt our new Protocol is a bit more involved, but really just means switch-ing over self and return the proper combination of settings for each case. That's just the basics when it comes to Protocols. They have much more to offer. More on this topic soon! There's also implicit dependencies we work with such as Xcode itself, or the language we write in. Today we'll look at some of the questions involved with using dependencies and try to answer them. Let's begin. Typically, it's good practice to try to limit the number of dependencies in general. Rules always have exceptions, but the thinking goes "the less moving parts, the less that can break." A decent way of thinking, but surely we don't want to build a full computing unit from raw silicone every time we have an idea for a new feature, right? "It's all about finding where to draw that line." Another reasonable guideline might be to "use libraries or frameworks that are used by lots of other people." This is great. We want code that's been used on the App Store, and on millions of customer's devices. Code in which most of the bugs have been discovered and squashed long ago. Once we've decided to integrate a piece of third-party code, we have to think about how. We've covered Cocoapods (#60) and Carthage (#11), or we could just add the git repo as a submodule, or maybe drag in a static library, whew! Any of these are fine choices, it's really depends on the use case. Cocoapods is great, but requires use of an .xcworkspace file, and clean builds will rebuild all pods from scratch. Carthage doesn't have those issues, but can sometimes be at odds with the latest Xcode/Swift compiler changes. Life needs limits. Whether its for usability reasons or maybe we're building the next Twitter, eventually we'll need to enforce a limit on how much content a user can enter into a UITextView. Let's take a look at how to do this. We'll start by defining our limit as a global variable, making it easy to change later. Next, we'll add a new UITextView to our view controller, and set ourselves as its delegate. (The text view's layout is handled off camera). Finally, in the shouldChangeTextInRange delegate function, we'll perform our checks. We'll apply the proposed changes, and check if the resulting length is within our limits. The Bool we return describes if the change should be allowed. A previous version of this Bite contained an inferior implementation of the shouldChangeTextInRange: function. The one shown here comes from reader Filip Radelic. Thanks Filip! Swift Enums are super handy. With associated values, they can be used in some quite interesting ways. Today we'll check out a couple. These aren't working examples, but might spark some ideas. Let's take a look. Those who have been an iOS, OS X, tvOS, or watchOS developer for any significant amount of time know that Xcode is an incredible tool for creating awesome apps. Until it isn't. Sometimes Xcode gets confused and needs our help. Today we'll look at one way we can clean up our environment and possibly get back to work. There's a myriad of reasons why the following technique resolves many common Xcode issues. The important part is that it works. Sometimes. Maybe. Anyways, there's this folder full of "invariants" and temporary files that Xcode shuffles things around in as we use it to build our app. It's called DerivedData and contains caches, compiler waste, build products, etc. If we ever find ourselves wondering if a certain compiler error or unexpected Xcode behavior really is our fault or a bug in Xcode, we can try clearing out this folder before jumping on the Google train. Then re-launch Xcode. Also keep those fingers crossed. Alternatively, we could use an app to do all this for us. 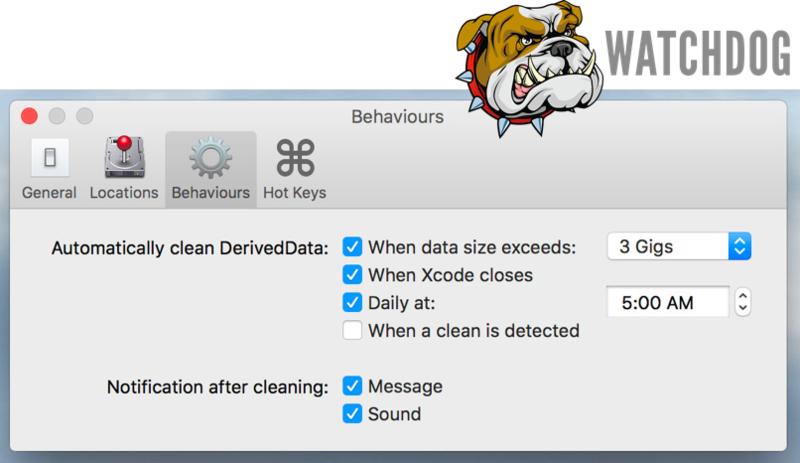 Watchdog is an app that lives in our menu bar and cleans up stale cache files in Xcode. Very cool! Today we'll check out a few different tips and tricks for working with UITableView. Let's get started. UIKit will interpolate & animate the changes, neat! The guard statement was added to Swift in its 2.0 release. It can dramatically increase the readability and clarity of the conditional checks in our code. It supports Swift's inline optional unwrapping as well as pattern matching. Let's try it out! Here we're ensuring that we have a fuelCell using optional unwrapping, then using pattern matching to make sure that our (now unwrapped optional) fuel cell has enough fuel in it for us to launch. Right away we can start to see how much clarity this adds. If either part of our condition fails, we use the else block to run some code then return from the function. Also as a bonus, the variables we unwrapped in the guard statement are now available, unwrapped, and in-scope for the rest of our function (anything below the guard statement). Neat! This allows the rest of our function to focus on the actual work being done, rather than checking for validity throughout. We can stack these up too, it's quite common to see multiple guard statements at the top of a functions in Swift. It's important to note that we aren't required to return at the end of a guard's else block. Imagine using guard in loops to continue, or in a function that throws to throw an error. Guard helps keep our code clean and readable. Happy guarding!